Porsche really knows how to throw a launch party! Just as important, they know where. 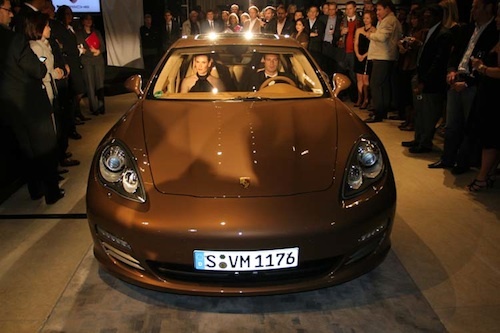 Porsche’s 2010 Panamera made its debut at Holt Renfrew’s ritzy flagship store on Bloor Street West in Toronto, on October 14, 2009. A phalanx of black-clad, big shoulder-types ensured that beyond the velvet rope was an invitation-only crowd. But when Porsche lays down an insignia emblazoned carpet in front of one of Canada’s great shopping destinations, onlookers and paparazzi will abound. 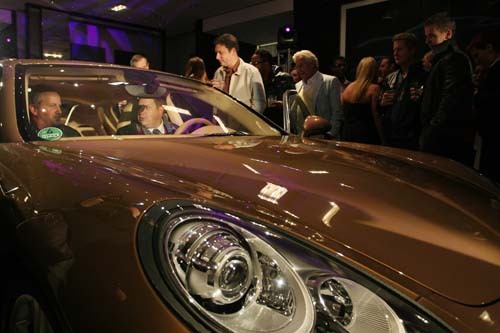 Those not on ‘The List’ certainly added to the spectacle that was expected with Porsche’s venture into the four-door luxury car World. Upon entering this mecca for upscale haberdashery, I was caught up in the frenzied current of our City’s populace that Porsche caters to. We were all circumnavigating the shrouded – and surprisingly large – star of the show. Speeches from dignitaries and invited special guests were thankfully brief. The sharp intake of breath shared at the moment the Panamera was unwrapped, no doubt left Porsche reps giving each other a mental fist bump. The four models that were hidden inside for at least an hour, emerged from the vehicle (could the interior be that roomy?) and went almost unnoticed. Those assembled only had eyes –and murmurs of praise – for this sleek fastback sedan. Having not driven the vehicle yet, the next best thing was to get inside and see what all the fuss was about. I have little doubt this will be just as pleasing on the road as any other Porsche. That was never in question. The only real unknown was could it accommodate 4 passengers comfortably? Well lets start with the actual seats. Each passenger gets their own sport bucket seat – definitely unconventional. The rear seating area is just as lavish as the front. A centre console runs between the seats housing the cup holders, seat switches and climate controls for each passenger. Legroom was surprising. One journalist I was traveling with is a former athlete turned sportscaster who at 6ft 2 inches, fit in the rear seat with no complaints and was still inches clear of the seat in-front. To promote the audio system in the new Panamera, Porsche facilitated the display of a home stereo system from the audio supplier Burmeister. The sound was starling in its clarity and clean bass reproduction. Sadly the 4 piece system plus speakers, was just a bit too large for my underwhelming family room. Oh yeah, it apparently retailed for about $150,000. For those fortunate enough to procure a Panamera, I can personally vouch for the equally stunning sound emanating from the Burmeister system in the Porsche. I suppose the other people at the event can also weigh in based on the dirty looks we were getting once we decided to put the sound system to the test. Panamermas will be on display in Holt Renfrew stores in Montreal, Vancouver and the Bloor Street location, till October 20, 2009. The Panamera will go on sale October 17. Overall the event gave Porsche an effective platform to showcase a vehicle that will no doubt continue the Porsche tradition of turning heads. The Porsche Panamera 4-door sedan/coupe looks like a vehicle that current Porsche owners can graduate to, or simply purchase to augment their current 2-door coupe.